Nerf Quietly Releases Mega XD Line, Magnus Blaster First Of Many? In a bit if a surprising twist yesterday, Gamerboy1659 of the popular Facebook group Nerf Modders Welcome posted what looks like normal Mega Magnus boxart. The photo shows just a Magnus boxart, minus the blaster. What’s interesting is that instead of the usual Magnus up to 85 feet advertised ranges, this one advertises up to 95 feet! There isn’t any other information from Isiah on where he got it from, or how much it costs. 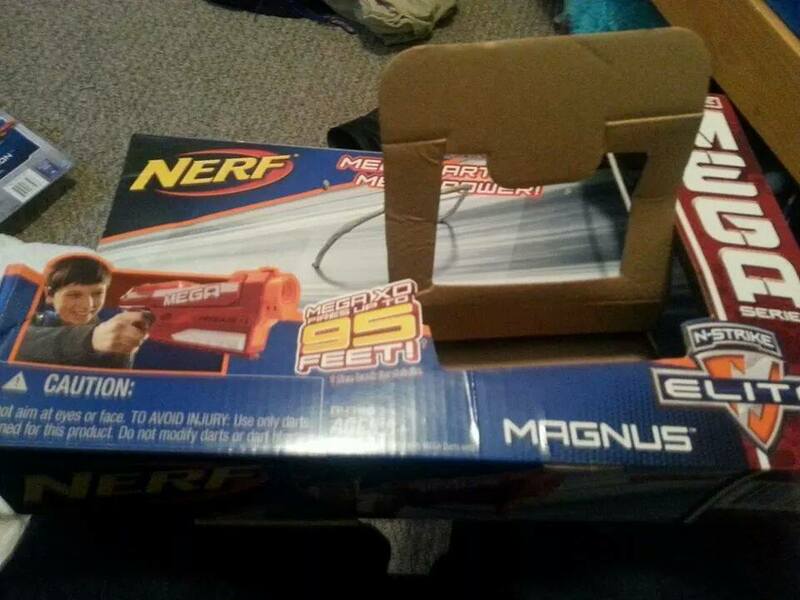 But based on previous Nerf trends it should cost the same, or about the same, as a normal Magnus blaster. While a 10 foot range increase isn’t super dramatic, it’s another step closer to the 100 foot ranges of the Mega Centurion. More range for the same price, in the same package is also another positive thing most of the tine. I’ll keep you updated on where he got it from, it’s cost, and other new information I can get related to it. I wonder if the upcoming Mega Bigshock will feature Mega XD ranges as well? Again based on previous behavior from Nerf, it would be very odd for them to make/brand a new line and NOT include more blasters into it. So I personally expect some upcoming Mega blasters to be put into this line. UPDATE: Gamerboy1659 has put up a video review of the Magnus XD blaster. I haven’t had the chance to watch it, so I’m not sure what he goes over in it. Shops.ch changes Vortex Revonix360 description, removes 3 disk shooting, blaster comes with stock?